I am writing respectfully, quietly – forming my thoughts with a whisper – lest I wake the tiny bear upstairs who is covered with a comforting ball of woolly stuff, tucked up warm in his circular nest. 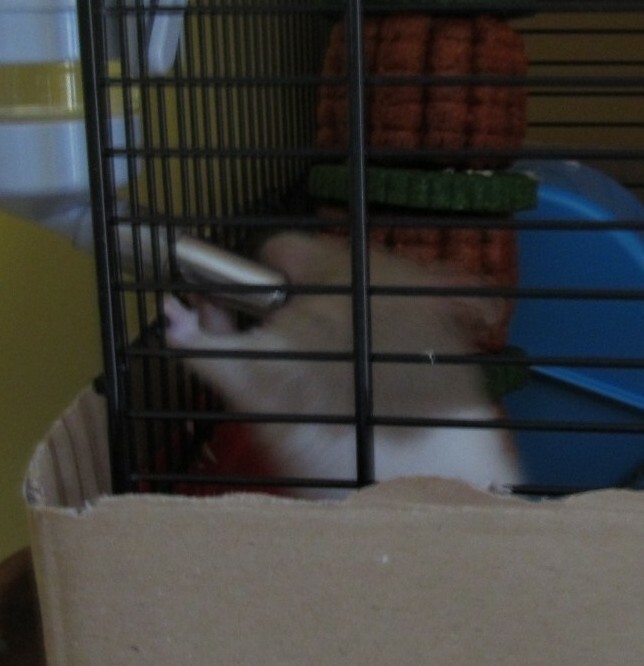 And this is because we have a tiny new friend; a new member of the Dickens clan: a sweet little hamster called Jo. How, we wonder, could this young orphan, with his opulent arrangement of living areas and jungle gyms, labyrinthine tubes, extension pods, alfalfa totem poles and carrot batons, get in touch with his inner crossing sweeper? Arguably Dickens’s most poignant creation – and certainly one to whom we have always wanted to show what home really means – the Jo of Tom All-Alone’s is hard to pin down, and in this respect only is like his little namesake, as this shaky action shot, mid-juice-drink, well shows. But unlike our velvety Jo, with his lustrous white and lavender-brown coat, the Jo who dies in Allan Woodcourt’s arms has not even a cage which he can call home. 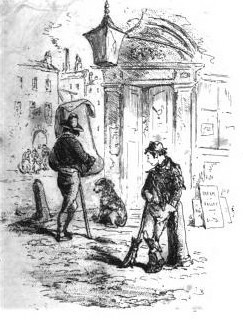 How fortunate we beasts are, to be loved and cared for, each according to his special needs: little Jo, left to sleep the day long, visited respectfully by an overjoyed Newman who contains his exuberance with only the greatest difficulty; watched admiringly by Barnaby who has so longed for his presence; visited silently by Jeoffry, who creeps in and out without comment; guarded by a small spaniel who – I think I can truthfully report – has maintained the perfect balance of curiosity and vigilance regarding our new friend. Last night, at his busiest, little Jo ate half his food supply, his growing appetite an acknowledgement that this is home, where he can relax and enjoy himself at last. When our humans look back on their lives with us, they hope that we will say of them, ‘He wos wery good to me, he wos!’, as Dickens’s Jo says of Mr Nemo, the one man in passing thousands who showed him kindness in his brief, disastrous life. All of us must be good to our little Jo and make worthwhile a tiny miraculous life – which too will blaze across our sky quite briefly – however small his world may seem. I’m sure your sweet hamster Jo would have kind words to say about you.